After we needed only 46 emails to sort out our car pooling and meeting arrangements we enjoyed our Friday night dinner at the Blue Mountains Hotel and continued to Dumphey’s Camp in the Megalong Valley. We were delighted to see that the camping ban that was in place last time I visited the area had been lifted and pitched our tents for the night. Next morning we packed our gear and discussed whether we should enter the Wild Dogs via Breakfast Creek or Iron Pot Ridge which concluded in Lilian telling stories about creeks infested by evil head-high stingy nettles and chanting “Ridge! Ridge! Ridge! Ridge!”. Thus, we ascended along Iron Pot Ridge and admired the views and the aboriginal water holes and sharpening grooves in the area. On the steep way down Ironmonger Spur talk began about the alternative having been a gently sloping creek bed, but we all arrived at the Breakfast and Cox junction with good spirits. Once we reached the junction we were surprised about the very low water levels of Breakfast Creek. I had never seen the junction with as little water before and we started to wonder whether the creeks we intended to collect water for the night were running. After a short break we ascended Blue Dog Spur on the other side and eventually reached Knights Deck where we enjoyed the fabulous views and a well earned lunch. After a good rest we continued along the ridge towards Mobbs Swamp where we were glad to see that plenty of water was available. 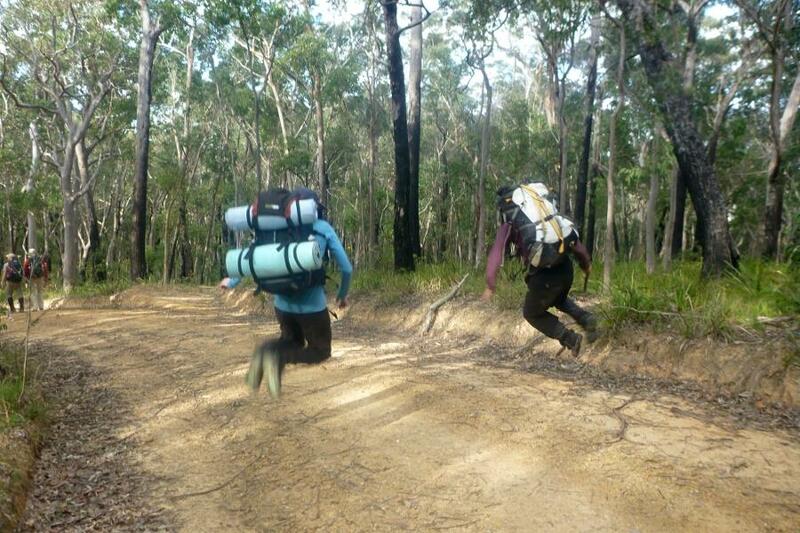 However, due to reports of campers having a dump near the water hole at Mobbs, we opted to take our chances and refilled our water supplies at a little creak closer to Mt Dingo before ascending to Splendour Rock. We finally reached the top just before dark, but unfortunately, we missed the sunset. After a good night’s sleep, we started along the high route towards Medlow Gap with the aim to “bag all the summits” of the Wild Dog Mountains. We followed the obvious track across Mt Merrimerrigal and from there across the saddle to Mt Warrigal. Here the track didn’t go over the top so we started to explore the ledges to find a way up through the cliffs in front of us, but only found camp caves at first. Eventually there was an obvious way up and we crossed the summit hoping for a way down at the other end. But when we reached the point, the only way down involved a scramble that we didn’t want to risk doing without a hand line, especially since one member of the party had shoulder issues. Thus, we retraced our steps and went back the way we came up and then around along the base. 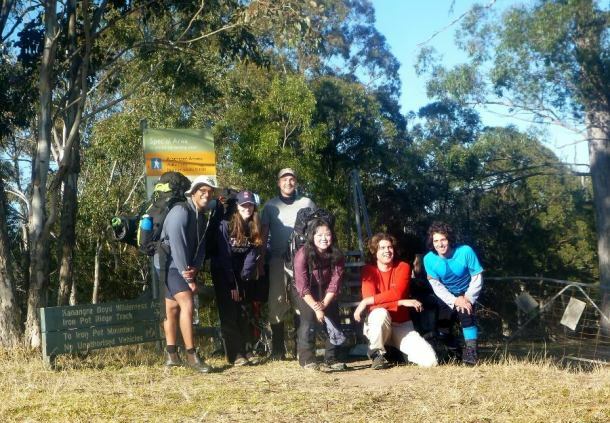 The next summit was Blackhorse Mountain which the map shows as a tiny, unspectacular hump on the saddle between Mt Warrigal and Mt Mouin. But as much as it looked unspectacular on the map, we were surprised about the impression and views we got from the top. The Mountain is a narrow rocky ridge with little trees that is elevated enough to allow great views to both, the North and South. Since it was just about mid day, we took the opportunity and had our lunch break. 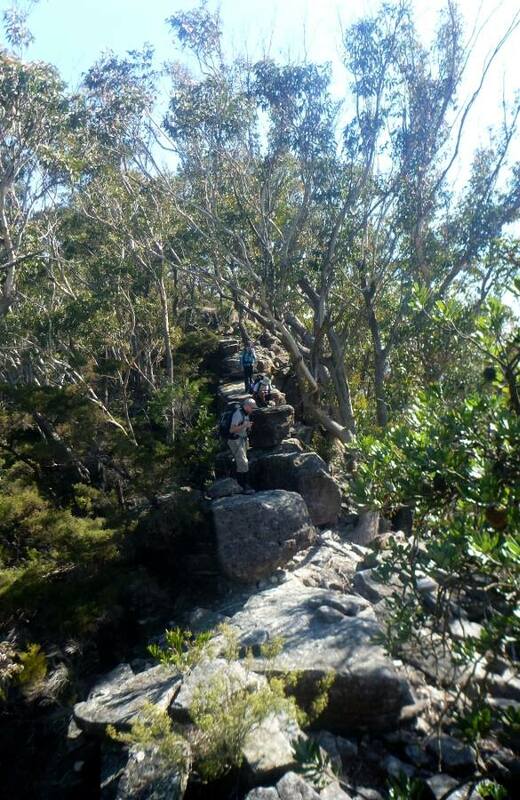 We then continued and bagged the final two summits of Mt Mouin. This time we got more lucky (or more adventurous) and we found a way down the cliffs on the eastern side. With some pack-passing and standing on shoulders we all made it down the cliffs and then continued down the ridge until we hit the fire trail. From there we had about a 10 km slog along the unimpressive fire trails back to the car. We then finished the day with another visit to the pub in Lawson before we all went our ways. All in all it was a great trip with good weather and a good group and I’m sure it wont be the last time I’m walking in that area. 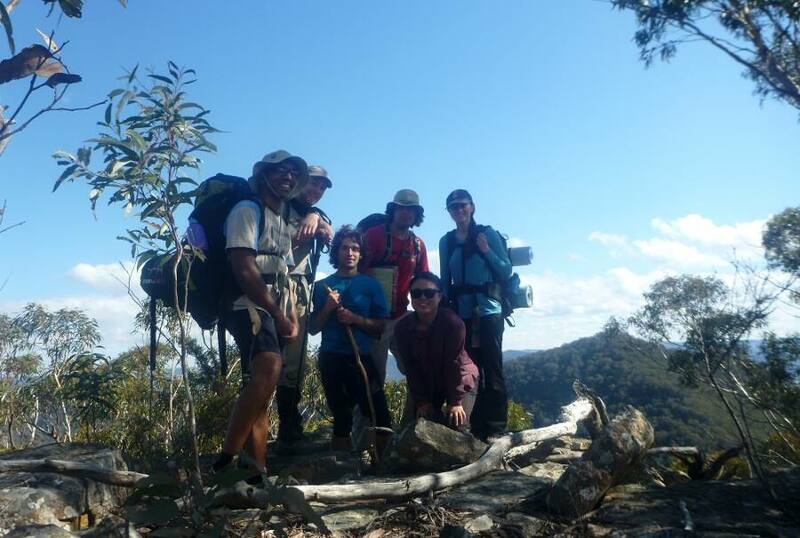 * We later learned that most of their group had no idea where they walked and they actually came via the fire trail and never set foot into Carlons/Breakfast Creek. But there is no reason to change a story just because it is untrue. On the firetrail back to the car.